The Kiltwalk needs teams of volunteers to help out at their events. 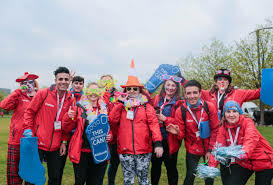 There is a wide variety of roles for teams to consider and your time and effort will help all the walkers to keep their spirits up and finish the walk. This is a great opportunity for your team and your organization to support charities throughout Scotland. The Kiltwalk is a unique charity that enables walkers to raise money for any Scottish Charity of their choice. By staging events that bring together thousands of walkers who fundraise for their chosen charity or cause, we support those in need of a helping hand. In 2017 there was 14,000 walkers raising money for 780 charities. £2.7 million was raised!! The very best news is every volunteer team representing a business can raise money for the charity of their own choice! Its a win-win situation for everyone involved! The Hunter Foundation donates £1.40 for each hour you volunteer for the Kiltwalk to a charity of your choice. This is a great opportunity for your team to get out, help a lot of charities to help people in need and have loads of fun at the same time. If your team or business would like more information then complete the form below and press send. Please note: ALL participants for these roles will be required to attend a 3 hour training session before the event. This will be a great opportunity to meet new people and bond as a team. Please be sure to complete all the required fields giving as much information as possible. Julie will contact you within 14 working days. Please note that a copy of your email will be sent to Helen Taylor for Volunteer Glasgow's records.